Marvel’s big crossover event Secret Wars arrives next week to herald the end of the Marvel Universe as we know it, but for readers looking for something a little lighter and accessible, there are still books like Rocket Raccoon to offer an oasis in the middle of all the world-breaking. 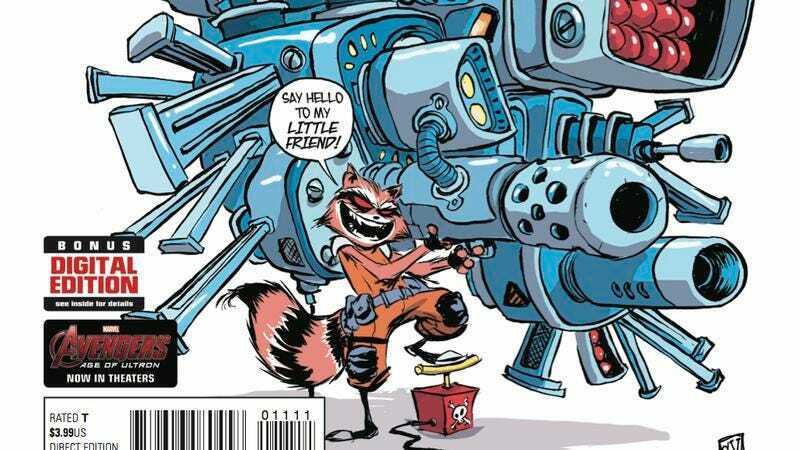 Writer (and artist of the first arc) Skottie Young has made this title one of the leading places for wacky, action-packed superhero high jinks that are equal parts Looney Tunes and Guardians Of The Galaxy, and Jake Parker has maintained the energy of Young’s visuals since taking over art duties. This preview of next week’s Rocket Raccoon #11 highlights that energy as Rocket makes his escape from flying robot assailants, speeding down the streets of an alien city on his motorcycle/jetpack hybrid. The dynamic layouts, evocative sound effects, and vibrant color palette by Jean-Francois Beaulieu all combine to create to an exciting action sequence, and the cartoonish style makes it a great book for young readers that fell in love with Rocket last summer on the big screen. This creative team understands that a story about a sharp-shooting space rodent shouldn’t take itself too seriously, and delivers a title that is perfect for people that prioritize fun in their superhero comics.